Here we go, talking about Greece, but fortunately, in a different way compare to the last financial and European news. We will speak in a positive way about a working site into a postcard background. 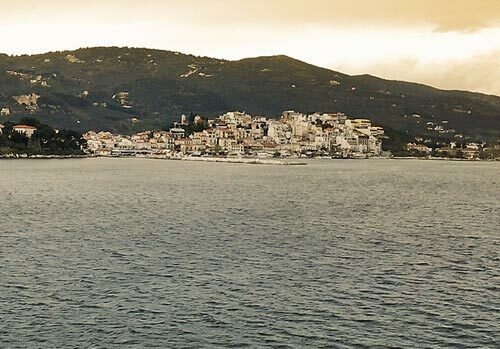 We are in the Skiathos Island in the Aegean Sea where we are working since May to create a new hydric pipeline going across the entire island. A really important project both for the local population and for the numerous tourists that every year spend theirs holidays. 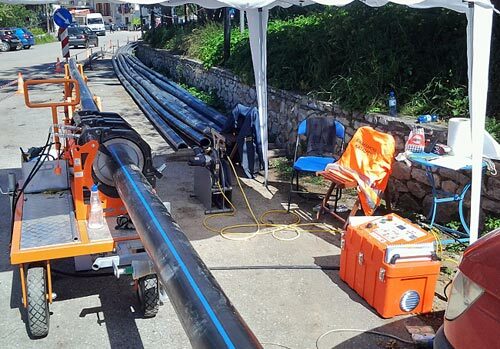 The new project develops through 15km and uses HDPE-100 SDR 13.6 pipes. Diameters change from 25mm up to 355mm …a really good branched job onto an area of nearly 50sq. km. 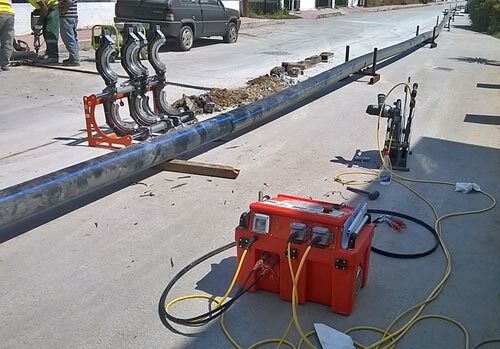 On site, we use RITMO welding machines, and for the most important work, we rely on a BASIC 355 EASY LIFE machine having the purpose to weld diameters such as 355; 225; 160 and 140mm. 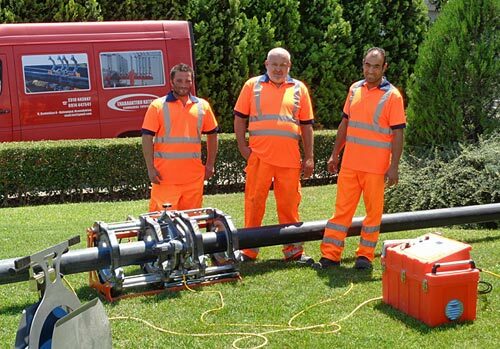 By its side, an electrofusion machine: ELEKTRA LIGHT operates to weld all the fittings necessary to allow variations on branches and diameters from 125 up to 25mm. Let us have a chat with Mr. Chris Dubiotis from ENALLAKTIKI KATASKEVI Company. “The working-site winds through an unbelievable sight of an island that rise up 400 meters from the sea level. 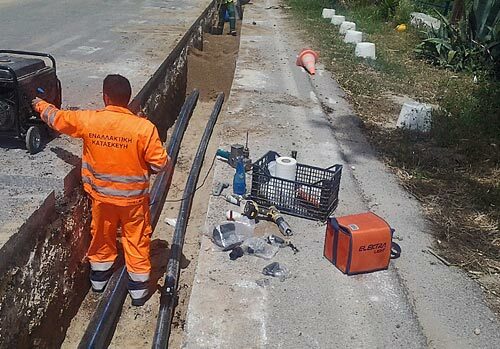 This make us working in a really hard and rocky ground, and this is not the only problem we have: all the context made out of narrow streets and small areas make the whole working conditions really difficult. In fact, we have to stop working to avoid complications to tourists. On the other hand, something we are really appreciating is BASIC 355 EASY LIFE workflow. 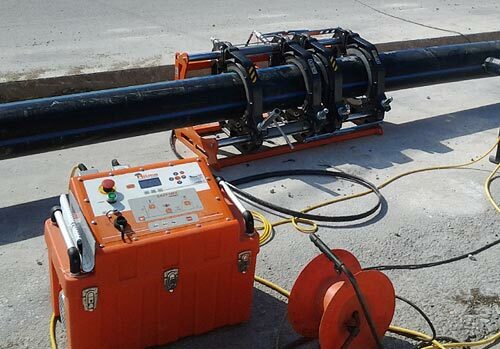 There could not be better choice to describe the concept of automatized welding. You only have to set welding parameters once and validate all the steps during the workflow. However, the best advantage is when we close the chassis to weld and control pressure phase starts. 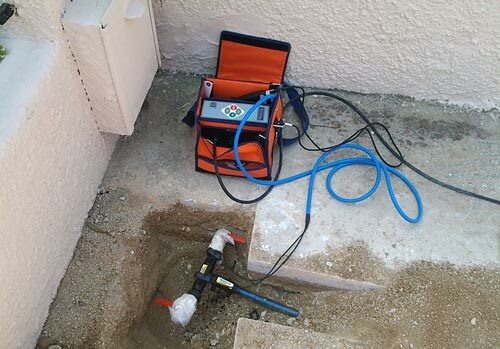 In this phase, the operator needs to be always careful and compensate eventual drops of pressure. 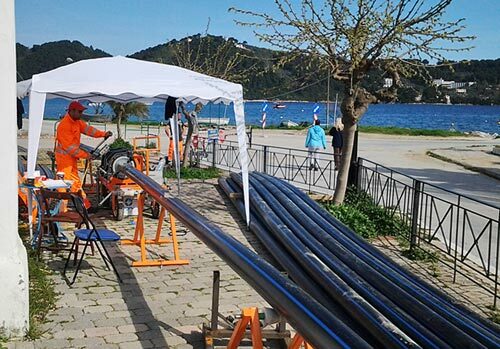 With Easy Life system, the electronic control of the gearcase provide to adjust the pressure: this is a huge advantage because it frees an operator from many responsibilities; therefore, he can concentrate in others working activities. Before leaving, Chris remind us that at this time of the year with the hot weather, many tourist are approaching and they have to stop working to start again after the touristic season. In the main time, we are sure: whoever is going to came here, will keep talking about Greece, but just looking at the bright side and holding in the heart great memories of the Greece, its colors and its sea.